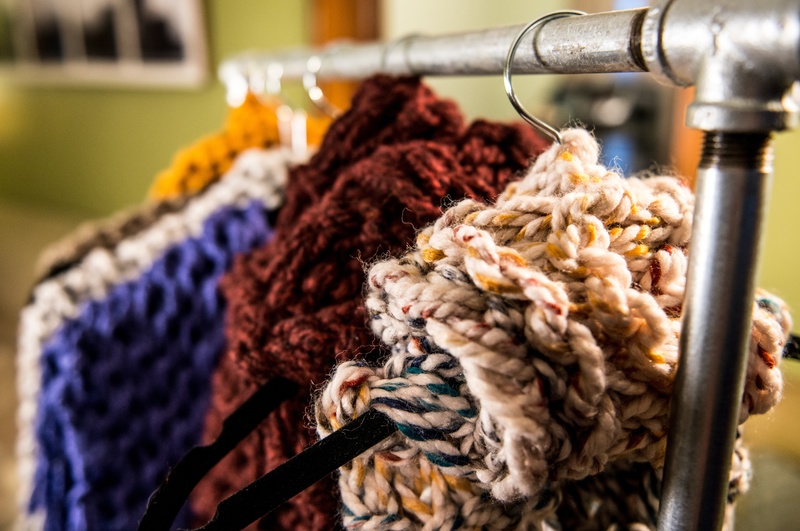 This week, we’re interviewing Little Birdie Design Studio’s Tori Tedesco, a knitter and knitwear designer from Dover, OH. Tori comes from a family of knitters, and she picked up the hobby as a hands-on activity to give herself a break from her graphic design job. 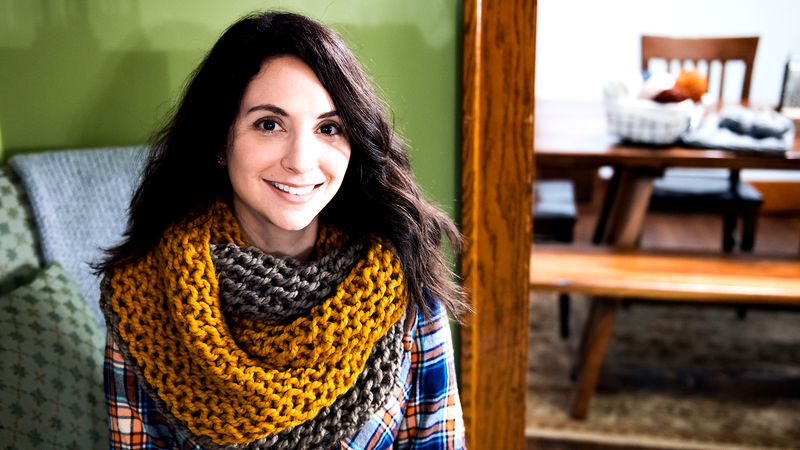 Tori loves using chunky yarns, large needles, and YouTube tutorials to help her create handmade knitted accessories. 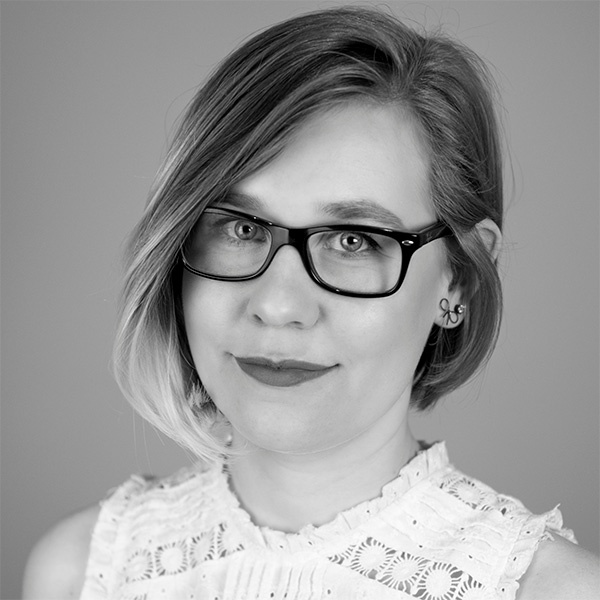 If your brand sells to knitters or crocheters, this 1-on-1 interview with Tori will give you some important insights into making connections with makers like her. 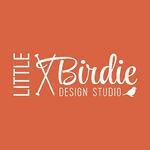 I’m Tori Tedesco, and I’m the owner and designer of Little Birdie Design Studio. I hand make knitwear for people and their homes. 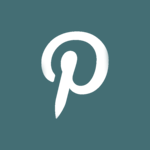 How and when did you get started doing this? I want to say back in 2008, I started just because I wanted to learn how to knit. It wasn’t probably until 2009 that my husband introduced me to Etsy (it’s probably sad that my husband introduced me to Etsy). I started selling on there and it all picked up from there. What is the process of coming up with designs like? For me, when I started knitting, I was looking at things that I didn’t like that I saw out there. I didn’t like the patterns you could find online and what everyone else was making; I wanted something that fit more of my style because back in 2008, things were more lacy, very pretty and frilly, and I’m not a frilly kind of girl. It was right in the time when chunky yarns were starting to come out and manufacturers were starting to make them and I fell in love with them. So that’s when I decided to start making really big, chunky scarves and I actually used my mom’s crochet needles that were giant, 50 US sized needles, to start working with the big, bulky yarn. From there, it was all about deciding what I needed and what I wanted to wear. It’s all trial and error, starting to make something and then ripping it back apart when it wasn’t quite the size I wanted it to be. I keep working until I get something I like and have a finished piece. It’s second nature now and I don’t even have to think when I’m making things. What research is involved with what you're doing? Before the time of YouTube videos was when I got started, so it wasn’t until now that I’ve started to really go online to teach myself more and to learn more and watch videos on new techniques. It didn’t exist when I started and I can’t read a pattern now to save my soul, so thank goodness for YouTube. I’ll watch tutorials when something’s not working or I’m trying to figure out something new. I go to YouTube and figure out from there. I’m such a visual person that I have to see it be done for it to click in my head. Reading instructions don’t make much sense to me. Why did you choose the big chunky yarn and why did you stick with it? I started because I took one knitting class at Pat Catan’s, and I learned two stitches. I never learned how to read an actual pattern, so when I was learning it was much easier with the bigger yarn vs. small yarn. It made more sense to me. Sometimes I laugh because my sister-in-law is an avid knitter. She comes from a family of crazy knitters, and they do tiny little lace and intricate pieces. And she looks at me and can’t figure out what I’m doing. I kind of made it up. 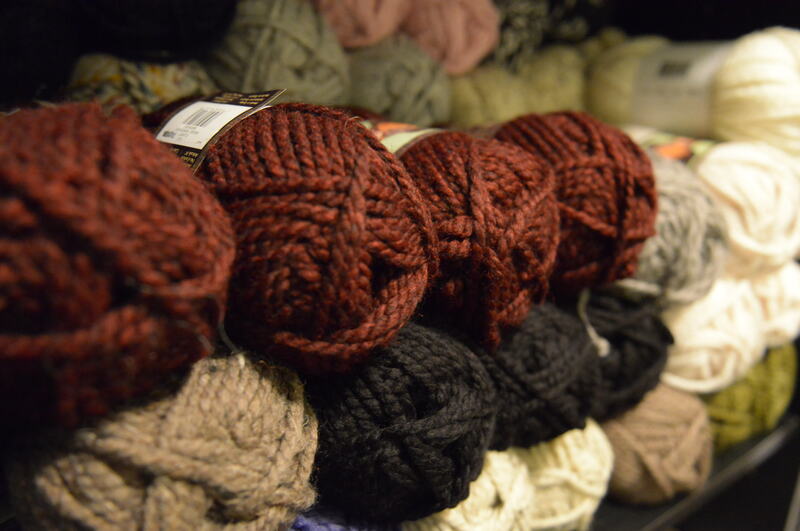 Using the chunky yarn is great for the texture, and it works nice and soft and squishy. My one style, the first I created, was so big that I could wear it as a hood also with my coat. It could be worn as a scarf, as a shawl, or a hood. As a designer, I like the simplicity of everything and keeping it very clean. Other materials I have used are fabric yarn/cotton material yarn that I use to do purses. I do make some summer scarves with them but not too often. Mostly just Instagram and Facebook. Is it important for you to have something to do with your hands each day? Yes, that’s actually how this started. I wanted something to take my mind off of being a graphic designer and being on the computer all the time. I needed something to veg out with and that’s where knitting came in. Do you get a lot of support from the communities of artists you're part of? Yes. That’s the best part about being a handmade crafter. Everyone is so supportive and we’re all in the same boat. Everyone is so appreciative of what others are doing. At shows, everyone is so helpful. They’ll ask if you need a break for lunch and offer to watch your table and stuff like that. It’s a very close community once you get involved and meet people. We've heard an issue for makers is that some consumers don't realize the work that goes into a piece is different than the masss produced version you can buy at the store. What's your take on that? That’s definitely a challenge to get that across to buyers. I would say I see differences in some towns than others. I’ve found that in Cleveland, people are really for getting handmade goods and they appreciate it, vs. less metropolitan areas where people appreciate handmade but don’t want to pay for handmade things. The market isn’t quite there yet. They’ll try a scarf on ten times and want it, but they’ll usually end up at Target to get a scarf. Hopefully we’ll get to a more willing market soon. I would say on Instagram, a lot of knitters follow each other and are so supportive of what everyone is doing by commenting and liking. It’s cool to see what everyone else is doing and what ideas other people have. I also have to say my husband. He’s always been very in tune to fashion, and he’ll come to me and say, “You know what would be cool?” or “Something like this would work great with an outfit like this,” and he’ll get me thinking about how I can come up with something that could work that way. He’s been beside me this whole way and helped me with a lot of my designs. He’s been a rock to guide me through. Do you show off your work? I’m on Instagram all the time. I mainly do craft shows in the fall because I can’t sell wool through August, so I do shows in Cleveland, Akron, and Columbus. This year I might head out to Toledo and Pittsburgh. Again, that goes back to the crafters talking about what’s a good show. I’m expanding my list and hoping to get into new shows this year. I want to get my stuff seen in new places. How much time does one project usually take? It depends. From shows, I’ve learned to create all price ranges. I have smaller scarves that are a nice size and don’t take me much time so I can keep the price down. They’re great grab-and-go gift items. Then I have higher up scarves that take me 4-5 hours to do for someone who really appreciates a handmade item. So scarves take me anywhere from 45 minutes to 5 hours. Because I have a full-time job and I work from home, I’ll knit in my mornings from like 7-8:30, then I start my other job, and after dinner and knit until I fall asleep, usually while I watch TV. 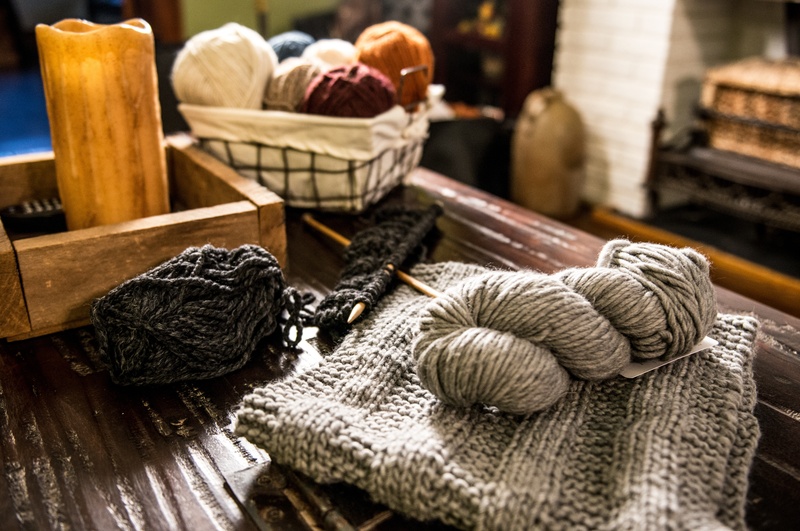 Do you find your knitting more of a challenge or something you do to relax? It started as relaxing. I never intended for this to grow as a business; I had no idea it could then. But now that it has, I’d say it’s still relaxing for the majority of the year. Come October, November, and December, it gets stressful. Then I am knitting nonstop and getting orders out. My husband is here to help me; he sews my labels in for me and he helps me package things up, so it’s not just me trying to get it all done. Husband of the year award, right there. If it’s something customer based, I always want to make my customer happy. Whatever I can do to resolve the situation or make something better, that’s my job. 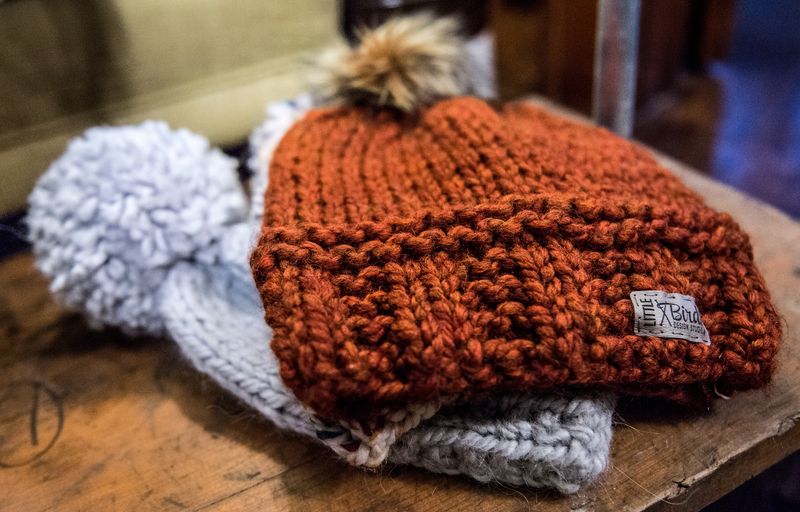 Once, someone sent me a message that said, “My dog ate the fur pompom off my hat.” And I just said, “Ok, we can fix this.” Also, sometimes I get wholesale orders for something like 50 scarves, which is a lot. At one point, inside I was half cheering and half crying. It was the middle of December. I had to be very honest that it would take weeks to get it done, and I was able to make the batches half and half. The fact that I’m working with my hands and I’m creating something is the biggest thing. Seeing somebody purchase the thing and love it is also important, or seeing them post pictures with it. Seeing my work being used out there or getting messages that say things like “I bought this for my sister and she loves it!” It’s nice to hear that my work travels to other places and people love it just as much as I do.